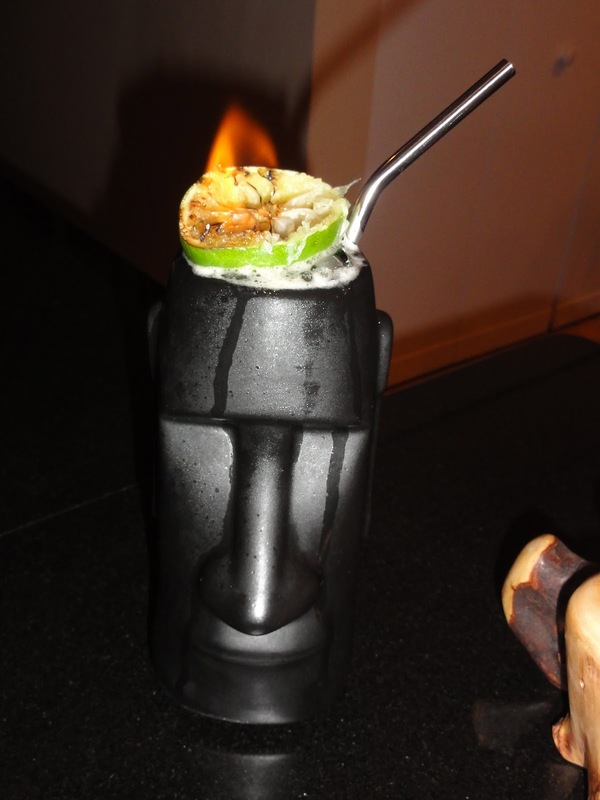 The Tiki scene, like classic cocktails in general, is reviving nicely these days. The lush, decadent marriage of tropical flavors and exotic kitsch carries us away to a better, less dreary place. Please join in and add your words, images, and offerings to the Tiki Gods on the 20th. Since Tiki is more than just the drinks, feel free to post on whatever Tiki subject floats your outrigger canoe...feel free to wax eloquent on aloha shirts, exotica music, decor, garnishes, food or whatever else moves you to enter the Tiki spirit! To help get in the spirit, on Sat night I hit up PKNY, my favorite NYC tiki spot, for a couple drinks. (Doug, they made a great Missionary's Downfall.) A tall frosty mug of tiki does have the magical power to whisk one away and forget the savages of winter for an evening, not that lady winter has been inclined to savage us much around these parts this year, thankfully enough. Perhaps someone distracted her with an Improved Chartreuse Swizzle or two. Kudos to them! UPDATE: Doug's got the roundup post of all this month's drinks up, go check 'em all out. Speaking of that drink, my submission this month uses its recipe as a jumping off point for my creation. Not only do I love Chartreuse, but I've found that she plays well with ginger, and I've enjoyed tinkering with my newish bottle of The King's Ginger, a liqueur I prefer somewhat to Canton because I find King's Ginger to be a bit less candied and have more of the fresh ginger bite I so love. So I swapped in King's Ginger for Falernum (though I added Falernum Bitters and Tiki Bitters) and used the seasonal Meyer lemon instead of pineapple juice, upped the JWray ('cause why not? ), and dubbed it the Gilligan's Ginger swizzle, which I thought was appropriately island-y. Oh, and in honor of our host, I garnished it with a tattooed lime (as well as a plastic naked lady from my PKNY drink Sat night). 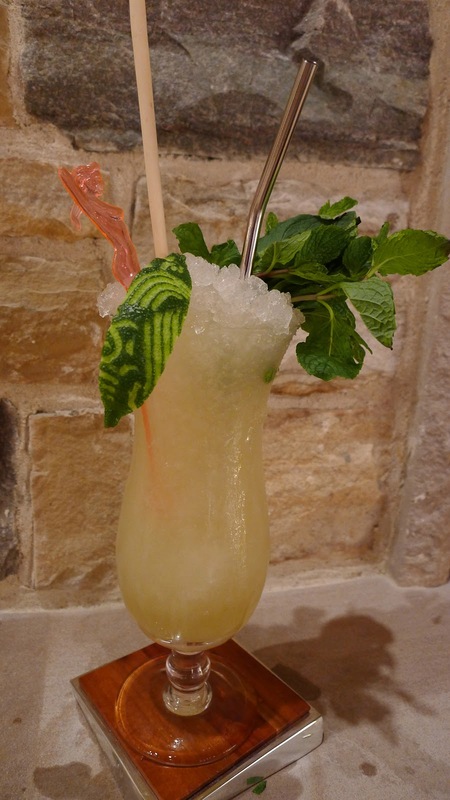 Swizzle over plenty of crushed ice, garnish with a tattooed lime, big ol' handful of spanked mint, straw, and whatever other fun tiki flair you've got. She's got spice and herbs from the liqueurs and bitters, funk and heft from the JWray (though both liqueurs are hardly low proof themselves), brightness from the citrus, and a touch of extra depth and richness from the luscious cane syrup. Just like any proper tiki drink, she might down a bit too easy. But what else would you expect? Get it? Tornadiki = Tornado + Tiki. 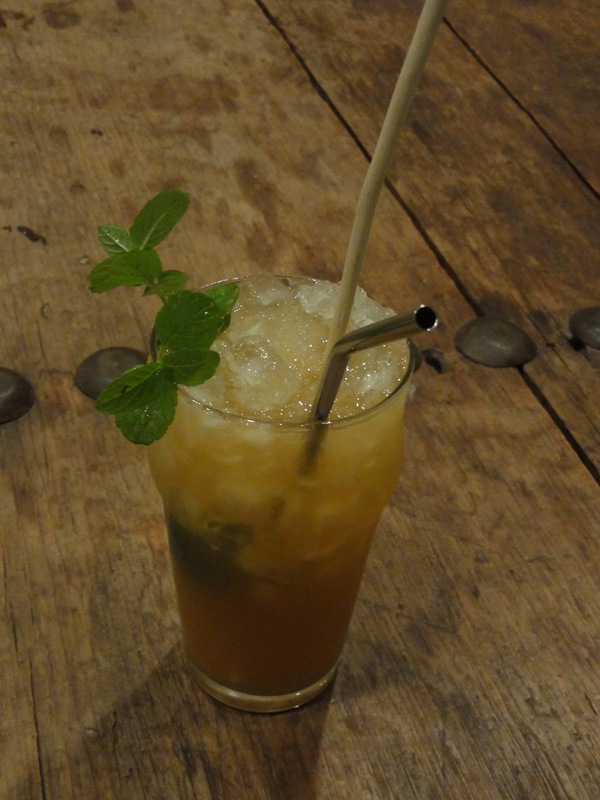 And it's a swizzle. This guy's got the bones of a hurricane with the rums and passionfruit, plus a litany of other usual suspects in the tiki oveure. in honor of this darkly exotic mystery, the goal of the night is to create tiki drinks with at least one German ingredient! Bonus if you use fire! I think the name translates from the German as something along the lines of "One way street", if you allow me a hefty amount of poetic license. And in fairness, you are probably better off splitting this with a friend, there's a lot in there, but I wanted to stick with the link between 1 oz of everything and the name. It's got a lot going on, but I thought it was not bad for something I threw together. At the risk of breaking the one way theme, it's pretty sweet with a full oz of cinnamon syrup, depending on how rich yours is, but it needed some; just go easy on it unless sweet is your thing. Seriously, that Gilligan's Ginger Swizzle is delicious. The Gilligan's Ginger Swizzle is one of the best drink names I've ever heard. Thanks guys, glad you appreciate it, enjoy!